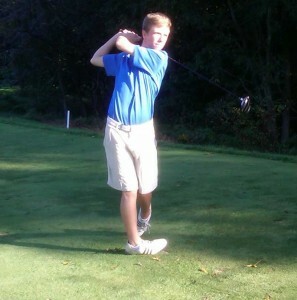 Nick Ward of Unionville qualified for the District 1 Golf Championships. Matt Carpenter (not pictured) also qualified. EAST MARLBOROUGH — Unionville High School golf team’s drive to a Ches-Mont League, American Conference Championship hit a West Chester Rustin barricade in the league championships at Kennett Square Golf and Country Club October 4. Needing a victory on their home course, the Indians fell to the Golden Knights finishing in a tie for second with Great Valley with a team score of 426. Unionville entered the tournament with an 8-3 record in the Ches-Mont and 11-3 overall. The Indians had defeated both American Conference champion Rustin (197-198) and National Conference champion Bishop Shanahan (197-210) during the regular season. District-One Individual Glof Tournament to be played at Turtle Creek Golf course in Limerick, PA on October 11-12. Junior Andrew Knight shot 86, freshman Blake Hinckley 88, sophomore Ryan Kowash and freshman Matt Kowash each shot 89.